from a blind window. The storm rages, we stand and wait. Wonderful Poem. Spring is coming. Oh, this is spring all right. Winters are peaceful! Thank you, Birgit. Bring on the grass. Oh my WORD, Anna. What a nightmare for you and your barn. May sweet spring be arriving soon! Kaylene, we were so lucky. The rescue I work with got it much worse and it’s calving season. And I feel a bit silly getting sympathy from someone in Alaska! Thank you for checking on us, green grass ahead. Oh my word! I just moved here from New York and endured the storm with two older horses that had been previously stalled their whole life. I had such joy at being able to give them the wonderful experience of freedom in a large pasture with a loafing shed as their new protection from the elements. Problem. I did not know that my rescue had apparently never seen a loafing shed. Had no idea what to do with it. Was afraid to enter it. Consequently, he stood outside in the rain that fell all night BEFORE the blizzard started. Thankfully I had put rain blankets on them. After a lot of coaxing he entered the protected area. I thought I was going to lose this majestic animal. To quote you if I may from your writings about moving to your farm, my dream was becoming their nightmare in front of my eyes. I dragged extra hay, warm mashes, and water buckets to them all day and into the night (owner of the ranch happened to be away in Arizona, LOL)! I was so exhausted by morning that I could barely move…..felt exactly what your words convey so much better. 🙂 But love is a powerful motivator and giver of strength. Apologized over and over to my four legged friends for what my decision had gotten them into as they shook violently with ice balls hanging from their manes and forelocks. Wondered if I made the right choice to move myself and them here….but then the wind stopped and the snow stopped and the sun came out. We had all survived, I had learned a lot, and loved them even more for their resilience and forgiveness. I will never forget it as long as I live. Prefer to never experience it again! :). I can’t even imagine what it was like for you on the Plains. Thank you for putting it into words that express the experience for so many of us I am sure, so beautifully. What a fascinating place!!! Yup, I do know that. Interestingly, the ones in the trees did better in this storm than those in shelters… and here, the wind was so fast that a blanket would have caused injuries. Weird to think about, isn’t it? Yes, they are tough, and I do like the tell the ordinary stories of what we do. Thanks, Debbie. Take care. Right there with you and Rusty. Weather is breaking my heart into little bits. It’s only the care I see others show their animals that helps mend it. Thank you. They are survivors, maybe if they get good care generally, they can tolerate some bad? No one got enough water, I’m sure. Thanks, Michelle. Lovely poem, it left me feeling a shiver! Good luck with the storm! I don’t blanket normally, but over the years I have found that the older or thin coated horses really benefit from a weatherproof warm blanket when it is super cold and windy/storming. You can reach under the blanket and feel how much toastier they are. Thank you! I’ve done it on elders. The neurologic donkey we just lost had one, too. The wind was a steady 40-50 mph and gusts as high as 100mph. A blanket becomes a weapon then, even well fitted, they get rubbed raw. Crazy wind. Thanks, Jinx. Mmm. The end of winter/early spring storms seem always the worst. Just when you think it is over, horses already shedding hair, I feel for the stock and the people who must tend them. Here in Oz while you were freezing (in a way we never do) we had a huge drought-breaking rainfall, but no, I’ve never had to break ice, or no more than half an inch on the top. You know, with a thick winter coat, if snow or frost is sticking on the top, that’s a sign the animal is not losing body heat, as body heat would melt it. I’m sure horses know it is merely something to be endured, and they are always very stoic in the cold. Thanks Anna. Yes, and shivering is warming as well. I knew they were okay, I just didn’t like it and that’s a waste of precious energy. So glad you all got some rain, mud, muck and what not!! I worry about weather, soon all of us will have all the weather… we had a big fire a few years back. Scary, isn’t it? I’ll be in NZ next week and I can’t wait! Sorry to miss Nelson this trip. Thanks, Liz. Shivering is also very energy consuming, and the best antidote is a belly full of hay, which then begs the issue of snap frozen water! Did you know they can learn to love a bonfire? Not in that wind of course, and you wouldn’t have the fuel/timber we have here, but I did know a man who was cleaning up fallen timber and his herd of minis would gather and camp around the fires. Enjoy your time down under , I’m also sorry you won’t be visiting Nelson this time ! Hopefully another time Anna. Just wanted to send warming recovery thoughts your way. Thanks, Lynell. I do that, too. Brrrrrrr. Good thing nothing lasts forever. Just feels like it. I must remind myself that animals are far more resilient than the human heart that breaks for what we perceive as their misery. For them, wouldn’t bearing the tough elements in a safe place be better than living in fear & uncertainty in the best of weather or the warmest box? 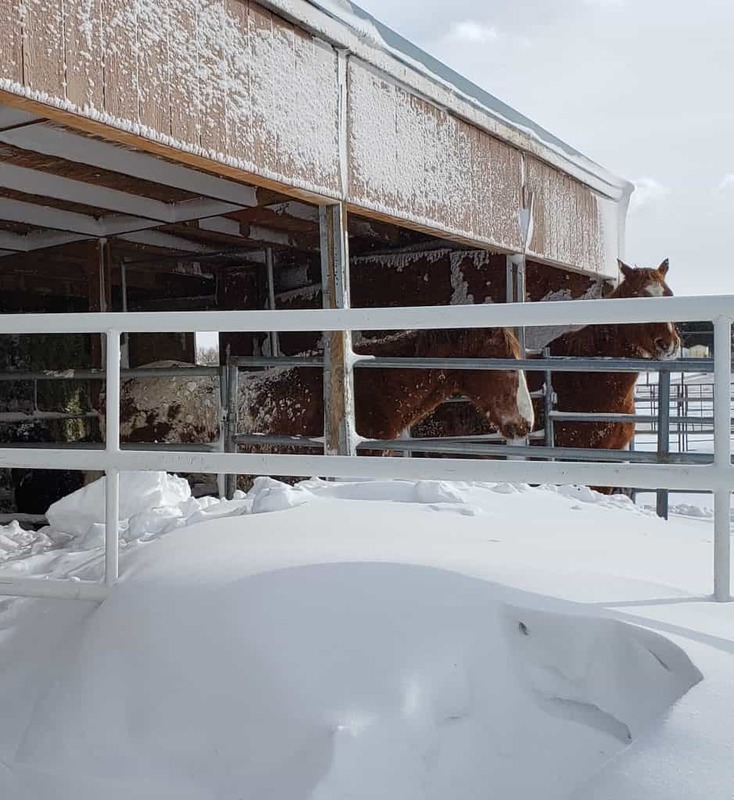 We don’t have very many extreme weather events like in CO (been there, done that too) but I’ve always wished I had a nice, undrafty, bedded in deep shavings, barn that they could get in out of it if they chose. When I was dealing with the last couple of years of my oldest one, I had to convince him that he DID need a blanket. He hated the things with a passion. In the end, I DO think he appreciated it and didn’t object as much the next night. They learn to deal with it just like we do… God love ’em! True, and I do use blankets in some cases, elders sometimes. Some of the sweetest barns had trees fall on them… I have trained blanketing in a blizzard and can tell you it’s smart. They understand it immediately. A storm like this one, sustained winds for almost two days, my husband had a snow drift in the trunk of his car. Being in a stand of trees was better for many because no drifting. Not sure we can ever out-think nature and here, extreme temp swings is one of the challenges. Thank you for commenting, Leslie. Gotta love the old guys. Mercy! 78 here in WA state today, snow last week. Hang in there luv, this time of year winter’s days are numbered. The best thing about a March storm is that it’s not a November storm! It was 40 degrees the next day, these weather swings make for colic and it’s the challenge living here with horses… now up to my ankles in mud. If you don’t like the weather here, just wait a day. Thanks, Shaste! No, that’s MY dream barn!! It seems weather is a challenge everywhere, but we got through and it’s been a drought so may this bring hay prices down! Thanks, Tricia. Goodness gracious Anna, if it’s not one thing it’s another. My heart goes out to you and your herd. Hoping the nice weather stays and the mud dries up quickly. Also sending positive thoughts your way for no colic. Colorado is a place of extreme weather, but we’re in the fifties and the 4 ft drifts are down to 2 ft. Yay! Thanks, Pam. Well, spring was sort of here Wednesday (you know, first day of spring! ), rained yesterday, today snowing & we have about 4-5 inches now – supposed to snow all day & into tonight. Its March in NY! The bad thing is the ground has thawed somewhat & plowing snow will take a really light careful touch. Was tapering off feeding the wildlife – back on again. These weather changes are hard on animals of all kinds… thanks, Maggie.